Our first Christmas as parents was awesome and busy. Ava and I began Christmas Eve with a visit into Kenny at the Fire Department since he was working and then headed down Mamaws for dinner. 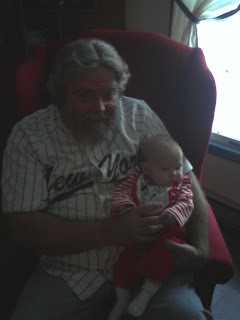 It was nice to be with family and I only saw Ava when she was wet or hungry, at times I would leave her in one person's arms then come back and she'd be gone and I would have to search the room to find her. She is so loved by many people. She got to spend a little time with Grandpa and her aunts. Christmas morning began with ice and sleet and we didnt know whether we were going anywhere or not. Kenny got home a little after 8am and we were at Aunt Vickie's by 930am. 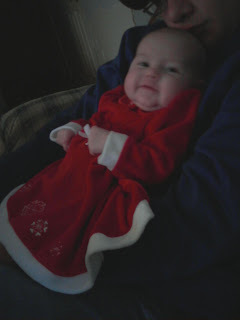 Ava slept in her grandma's arms (Kenny's mom Sue) and then ate before heading to grandma's house to open gifts. She got to play with Aunt Erika and Uncle Keith. She had a ball, since her belly was full and she had had her 20 minute power nap she was smiling and talking and she made a new friend, their dog Sally. It was sooo adorable, Sally kept going up to her and sniffing her and then actually gave her a little kiss on the cheek. Once the presents were open and the visiting was done there, we headed to Nanny's house (my mom) for dinner and presents. She slept the way into town and most of the time we were at my mom's house. Mom got her lots of clothes, which she needed for this winter weather and a couple of toys that make noise and light up. Then finally we headed to Berkeley Springs to visit Grandpa and Grandma (Kenny's dad and step mom). Her Aunt Jacki (Kenny's step sister) was home from WVU for Christmas, and got to visit with her, Jacki has not physically seen Ava since she was 3 weeks old, she turned 3 months on Christmas Eve, so it had been forever since she held her so we made sure she got lots of time with her. We finally made our way home around 630pm and boy were we tired. Ava crashed on the way home, woke up only to eat her bottle and then went back to sleep around 8, woke up at 130am for a bottle and slept in until 7am. I was shocked, I figure she must have been really wore out from her busy Christmas and so was I. At the end of the day, it was just nice to sit back and think of her day and how much fun the people that love her had watching her smile and talk and bounce around all day. She is so lucky to have so many people in her life. They all love her so much and I saw that in each of their faces on Christmas. Ava made out like a little bandit, she got lots of clothes and toys and she isnt even finished yet, we still have my dad's Christmas to go to. Kenny and I are so blessed to have her in our lives. This year has been so special to us, watching her grow and do new things. 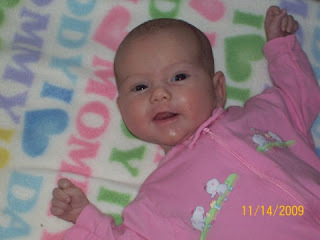 She is starting to roll over and she wants to giggle so bad but just cant get it to come out yet. It was a special day and I cant wait to see what next year brings us. Each day is just a blessing. Three months ago on September 24th our little girl entered this world. I cannot express how much I love her. It's amazing that now our whole world revolves around Ava and we don't even think of ourselves. The moment I saw her I was in love. 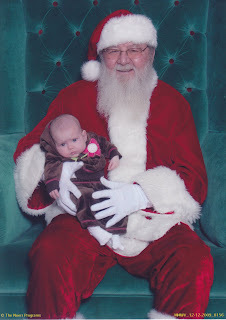 This Christmas eve, she will be 3 months old, she is holding her head up, looking all around, soaking in everything we say. She has grown so much in so little time. I can't even remember my life not being a mom. She has brought so much joy to our lives. Kenny and I's relationship has grown stronger than I could have ever imagined. Our purpose is to take care of each other and of Ava and her needs. She is the best christmas present I could have ever asked for. My 26th birthday could not have gone better if I tried. Ava and I spent the day playing and talking. I had a wonderful visit from Sarita and Janice, that made the day go a little better and quicker. I have to say even though Kenny wasnt home, it kinda felt like he was, through texts and calls and emails, we were communicating all day. My birthday was special as it is every year with him. Ava also made the day a little more special than any other year, watching her smile is one of the best experiences ever. I want to thank everyone that called, texted, posted, and emailed me birthday wishes. It really meant a lot to me. Just remember it is now officially winter, even though we just got dumped with 20 inches of snow, and only 4 more days until Christmas...another reason I love my birthday...the holidays make everything a little more exciting and special.